No visit to Friedrichshafen would be complete without a visit to the Zeppelin Museum. I went to visit with both my former professional hat of museum director and my new hat of Zeppelin enthusiast firmly on my head. It is overall a fascinating place. The most impressive exhibit is the partial Hindenburg replica, complete with some bedrooms, a lounge and the writing room. 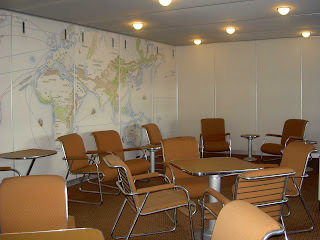 These are very faithful indeed to the original and give some sense of the grandeur of travel at this time in history. While it could be enhanced by moving videos outside the windows, and some sound, it was still an enjoyable experience. It was easy to spend a lot of time with the engines and structures exhibits. 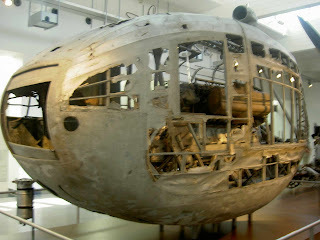 To see the engine gondola from Graf Zeppelin was quite incredible. I had read the excellent book by Eugen Bentele, "The Story of a Zeppelin Mechanic" as well as Paul Lagasse's 'Seeing Through Clouds' and this exhibit really made those experiences real for me. I was also intruigued by the two galleries showcasing artifacts from the first world war Zeppelins as well as the time just before the second world war. Unfortunately the items are in glass cases, with back lit displays behind them presumably to encourage compliance with the 'no photos' logos on the entrances to these two rooms. 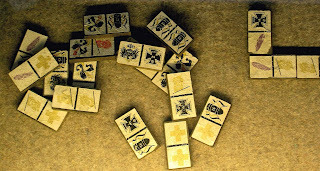 However, it was possible with some patience to try some longer exposures and I was able to capture this piece of a war Zeppelin sold to finance the war effort, and these dominoes from the Hindenburg. Can you spot the purple Zeppelins? 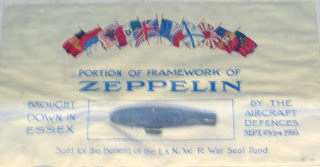 The traveling exhibit gallery currently features the Zeppelin NT. Also worth a peek to get the history on the new Zeppelins. The visit ended too quickly. When I think back, there aren't as many artifacts as one would expect, perhaps symptomatic of the fact that the original Zeppelin hangars and Zeppelins were dismantled and mostly recycled. However it was unusual for there not to be originals of the wonderful advertising posters, and more items such as plates and silverware, philately, brochures etc.